Don’t lose your money to online con artists. You can use our tips to identify and avoid fake, fraudulent or scam websites. Read on to find out what to watch out for when shopping online. Is it a scam or a rip-off? 2 Is the offer too good to be true? 7 Can you trust a trust mark? Fraud is now at record levels, and while there are sensible steps we can all take to protect ourselves, an unfair burden has been placed on the public. 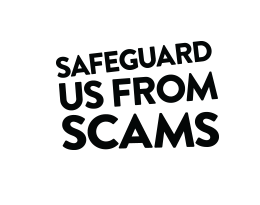 Join us in calling on the government, regulators and businesses to do more to safeguard us all from scams. It can be difficult to spot a fake, fraudulent or scam website. Fraudsters are extremely cunning and good at creating convincing websites. Take these eight simple steps to test whether a website is legitimate or not. A lot of fraudulent websites will use a domain name that references a well-known brand or product name. But won't be the official website. For example, website domains such as www.ipadoffers.net or www.discountnikeclothes.com should raise alarm bells. You should also be cautious of domains that end in .net or .org, as they are rarely used for online shopping so may have been acquired by questionable organisations. When you see very low prices with ridiculous discounts, you should be a bit suspicious. If prices seem too good to be true then, sadly, they probably are. Scam websites use low prices to lure bargain-hungry shoppers to quickly sell fake, counterfeit or non-existent items. You can use our tips for spotting a scam to help you identify if something is actually a good deal or simply a con. Alarm bells should ring if you are asked to pay for something online via a bank transfer. If you buy something that turns out to be fake or non-existent with a credit or debit card, you do have some rights to get your money back. But if you pay by bank transfer, there’s very little you can do to get your cash back. Take a couple of minutes to double-check the site. Maybe visit the homepage or the ‘About us’ pages and read the text there. Watch out for poor English, such as spelling and grammar mistakes, or phrases that don’t sound quite right. It could mean the site isn’t genuine and was put together by someone abroad looking to make a quick profit. You should also check that the website lists any contact information. Reputable and legitimate companies will always list ways to get in touch with them; if the website doesn’t have a ‘Contact us’ page, it could well be fraudulent. If the site does have ‘Contact us’ page but only offers a form to fill out, be wary as this could also be an indication of a dubious website. Any company offering goods or services should list a place of business, as well as a phone number or email address through which to contact them. If none of this information is available, you should treat the website as highly suspicious. If the company is selling a product online, it should have a shipping and returns policy listed on its website. If it’s a real company, it should tell you how and where to return a faulty item. Look at reviews across a number of sources, such as Trustpilot, Feefo or Sitejabber, which aggregate customer reviews. Don’t look at just one review website – check several to avoid being influenced by . You should also check the company’s social media pages for recent activity and to see what other people are posting on their social channels. 1. Are there lots of oddly similar reviews? It should be a red flag if you notice a similarity in the reviews across several websites. Reading through reviews, you might notice a whole set that use similar word groupings and writing style. This often means the reviewers are either copying information or that the reviews were all written by the same person. Watch out for reviews from new accounts. Some of the reviews should be from long-standing members of the site. Facts are important in a review; don’t trust a review if facts or actionable information is light on the ground. In this case, it’s probably best to give any suspicious website a miss. Research carried out by ANEC, a European consumer organisation, found that seven in ten people say they’re more likely to use a website with a trust-mark label or logo. But with more than 50 different trust-mark labels and logos in use across Europe, and many countries also not using them at all, they are not always a sound way of judging whether a website is trustworthy. Also, just because a website appears to carry the logo of a reputable trade organisation, it still doesn’t necessarily mean the website is genuine. If you’re in doubt, you could always contact the trust-mark company to check. Most browsers show a green padlock next to the website's URL - this is a handy way to see if a website is trusted. But this step should only be used in tandem with other checks, just in case. Top three holiday scams – would you spot them?